We describe the global behavior of the dynamics of a particle bouncing down an inclined staircase. For small inclinations all orbits eventually stop (independent of the initial condition). For large enough inclinations all orbits end up accelerating indefinitely (also independent of the initial conditions). There is an interval of inclinations of positive length between these two. In that interval the behavior of an orbit depends on its initial condition. In addition to stopping and accelerating orbits, there are also orbits with speeds bounded away from both zero and infinity. A second hallmark of the dynamics is that the orbits going at a finite (but non-zero) average speed tend to have close to constant speed. In the setting of this model these phenomena are robust in the sense that they are independent of the ‘ruggedness’ of the staircase and of the coefficients of restitution that govern the energy loss at each bounce. The behavior just described matches up well with physical observations of single particles falling down a rough slope as well as measurements in laboratory controlled avalanches. 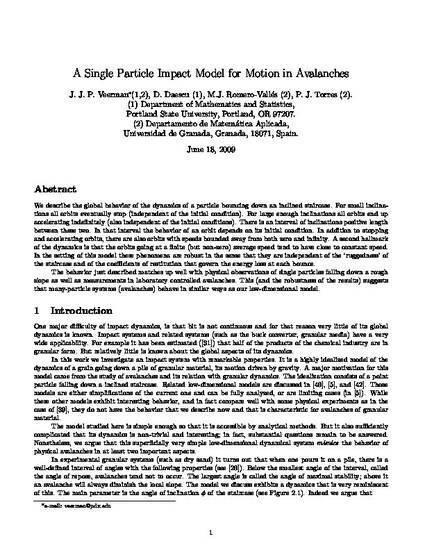 This (and the robustness of the results) suggests that many-particle systems (avalanches) behave in similar ways as our low-dimensional model. This is the author’s version of a work that was accepted for publication in Physica D: Nonlinear Phenomena. Changes resulting from the publishing process, such as peer review, editing, corrections, structural formatting, and other quality control mechanisms may not be reflected in this document. Changes may have been made to this work since it was submitted for publication.